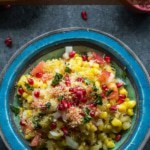 Try this non-traditional way of making corn bhel or corn chaat* and you’ll be hooked. 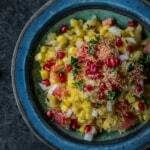 While most Indian street food demands a mandatory drizzling of tamarind chutney and green chutney, this no-fuss corn bhel recipe doesn’t require either. Since corn bhel is best served at room temperature, it is not only great for snacks but for school lunches too! Note: Chaat refers to the savory snacks that are often eaten at the roadside stalls in India. I know what all you chaat loving, corn bhel loving folks are thinking. How dare I put up a recipe for Corn bhel and say it is okay to skip tamarind and coriander (green) chutney? GASP! I know where you are coming from but hear me out. 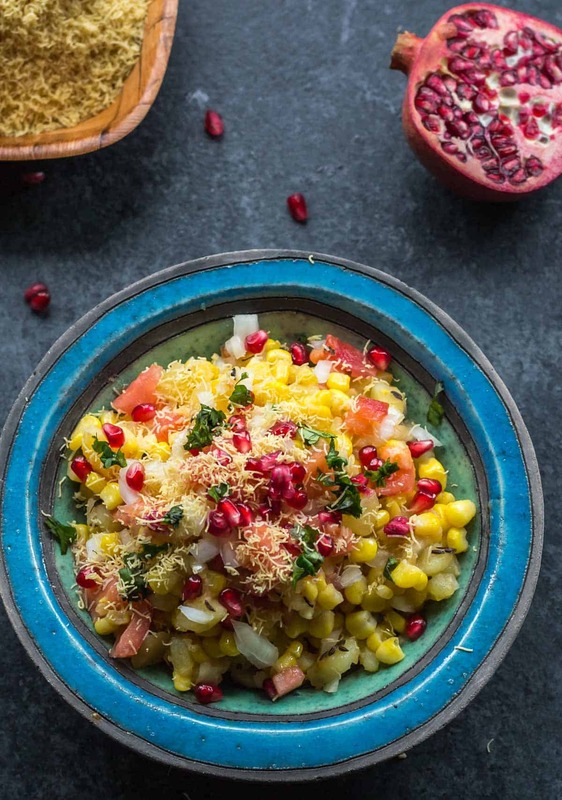 Just like you, I have always had corn bhel the traditional way – corn, potatoes, onions mixed together with chaat masala, drizzled with the chutneys and sprinkled with a generous serving of sev. 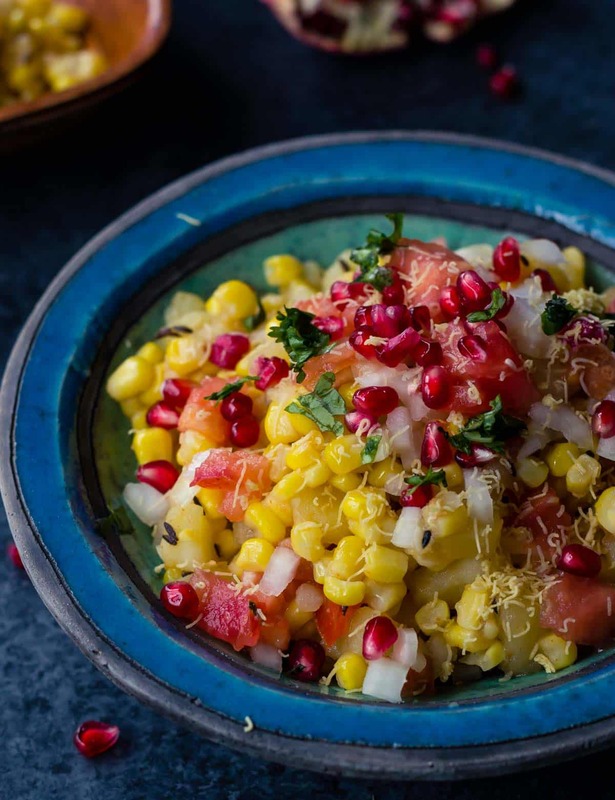 Corn chaat made this way is delicious and finger licking good. Every morsel tickles your taste buds – a bit of tang, a hint of sweetness just how chaats are supposed to be. One bite and I was hooked. I was actually able to taste the corn – in all its goodness. It was far from being bland. The combination of lime juice and sugar ensured that this dish had the tanginess and sweetness that we expect of street food, without using chutneys. Accompaniments – This corn bhel tastes absolutely delicious when topped with Haldiram’s khatta and meetha mixture or sev. Health conscious folks, please feel free to skip it though. 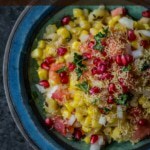 I realize that this version of corn bhel may not be for everyone and if you make it and hate it – all you need to do is drizzle it with tamarind chutney and green chutney to turn it into the corn chaat you know and love. But before you do that, I ask you to give this recipe a shot and relish the sweetness of the corn just like I did. How to make corn bhel? 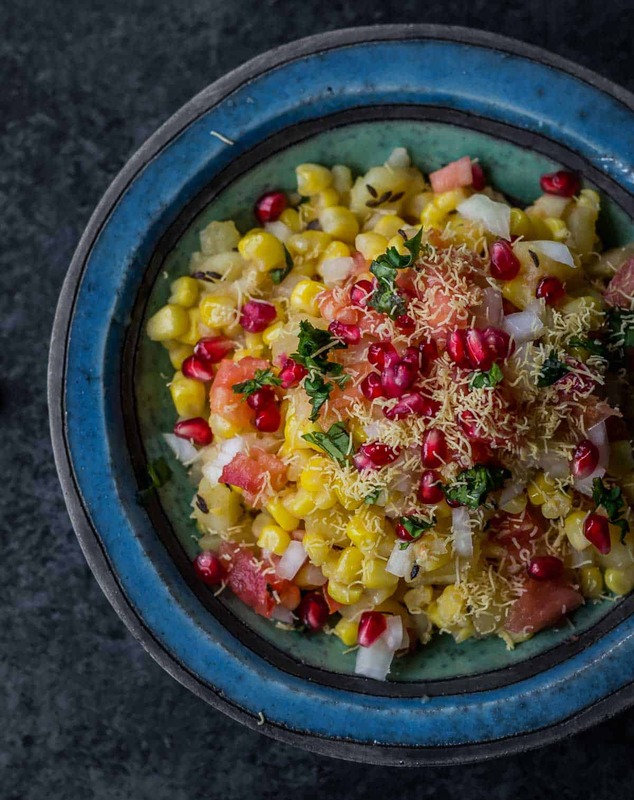 Try this non-traditional way of making corn bhel or corn chaat and you'll be hooked. Since corn bhel is best served at room temperature, it is not only great for snacks but for school lunches too! Cooking corn: Boil the corn in a saucepan with 2-1/2 cups of water till done. Drain the water and set it aside. Cooking potatoes: Pressure cook till the vent goes off once. Let it cool completely before taking the vent out. Set the potatoes aside. Heat oil in a kadhai or wok on medium heat, add cumin seeds and when they begin to splutter, add garlic and chili powder. When the garlic starts to slightly brown, add asafoetida (hing), corn, sugar, salt and stir well. Switch off the gas. Add remaining ingredients - onions, tomatoes, and potatoes and mix well. Garnish with coriander leaves. [Optional step] Sprinkle sev, pomegranate seeds and chaat masala over the bhel before serving. Pour 2 cups of water in the steel insert of the Instant Pot. Place a trivet and on top of it, stack a bowl of chopped potatoes followed by a bowl of corn. [Note - you don't have to add water to the bowls- just rinse the potatoes and corn]. Press the 'Steam' button and steam both the potatoes and corn for 8 minutes. Allow it to cool down before opening the lid. Remove both the bowls and the trivet and drain the water from the steel insert and wipe it dry. Add oil in the steel insert of the Instant Pot and press the Saute function. Press the Adjust button to move the selection to “low” and wait till the display reads “Hot.” Add cumin seeds and when they start to splutter add garlic and chili powder. When the garlic starts to slightly brown, add asafoetida (hing), corn, sugar, salt and stir well. Hit the warm/cancel button to switch off the heat. Just lovely Anu, like a corn salsa but better! 🙂 Thanks, Kevin. You nailed it! It sounds exactly like a corn salsa.